Learn about the precautions that should be taken when removing lead paint. Many homes built before the 1970’s have lead paint lurking somewhere inside. Chances are it has been painted over numerous times by now, but the potential for contamination still exists, especially in areas where painted surfaces rub on each other, like window frames and doorjambs. If you suspect you have lead paint in your home, H2 Environmental can help. Before you call us, take a moment to review these important facts about lead paint removal. First of all, it is important to realize that lead paint removal isn’t really your ideal DIY project. To avoid actually contaminating your home more than it already is or exposing your family to additional lead dust, it’s best to select a qualified contractor to handle the project for you. Look for a contractor that is EPA certified Lead Safe. There is more than one method for removing lead paint. It is important to choose the right method for your project so as to create as little lead dust as possible. Dry sanding should never be attempted. Wet hand scraping or wire brushing is a good method for small areas like window frames and door jambs, while wet power sanding is typically best for large areas. When using a power sander, the tool must be equipped with a HEPA filtered vacuum attachment to capture the old paint. Low-temperature heat stripping may also be done by professionals. Before beginning a lead paint remediation, it is important to take steps to control the lead debris that will be created. For outside work, lay down heavy plastic sheeting to protect the soil from contamination. For indoor work, make sure the room is completely sealed off from the rest of the home and remove all furnishings or cover them with a double layer of plastic sheeting. At the end of every day, the work area needs to be cleaned. Mist the debris with water, sweep it up, and bag it securely. Then mop the area. When the project is complete, every surface should be vacuumed with a HEPA filter and then mopped. Be sure to throw away any rags you use in the cleanup. Any carpets or furnishings should also be cleaned or replaced. Although removal is the most common way of dealing with lead paint hazards, it is not your only option. You can also control lead dust by enclosing the painted surfaces behind new drywall or covering window and door jambs with vinyl or aluminum. 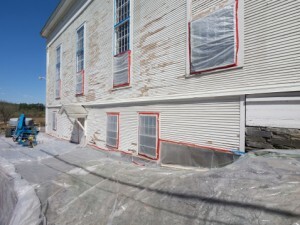 Another option is to use a special sealant to encapsulate the lead paint behind an impermeable new surface. Finally, you might consider replacing painted items instead of stripping and repainting them.